Diamond Jewel is a spoiled, willful hellcat, bent on avenging the murder of her beloved father. 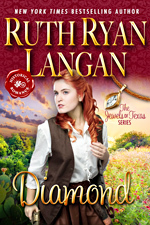 When down-on-his-luck rancher Adam Winter is found not-guilty of the crime, Diamond refuses to believe in his innocence and sets out to mete out her own justice. But something about this mysterious stranger stirs her blood in other ways. Diamond may be a master gunfighter, but she's a babe-in-the-woods when it comes to matters of the heart. Though both fight to deny their feelings, love has a way of conquering all. Prim and proper Pearl Jewel arrives from Boston as soon as she reads of the death of her beloved father. 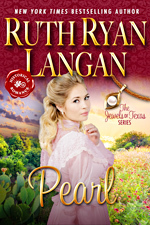 She receives a frigid reception from Diamond Jewel, who considered herself the only child and heir of her father's successful ranch, until the arrival of this stranger. Cal McCabe, Diamond's ranch foreman, is a hard-as-nails cowboy with no ties. He likes it that way. But he can't deny an attraction for this shy elegant woman he can never have. The Rev. Wade Weston is haunted by a sordid past, and declares war against sin in the small town of Hanging Tree, Texas. 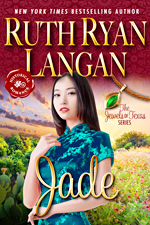 When exotic Jade Jewel announces plans to build a pleasure palace, the peace of the entire community is threatened. 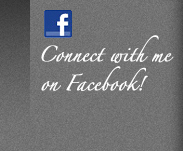 What is worse, this woman arouses a passion in the good preacher that threatens his very soul. Ruby Jewel, fresh from the Louisiana bayou, is all curves and passion and heat. 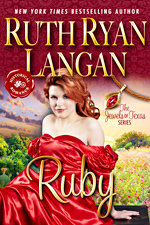 Marshal Quent Regan is a straight-arrow lawman who has his doubts about Ruby's honesty. But his obsession with this sultry beauty threatens to have him breaking all his long-held rules. Yet another Jewel heir emerges from the wilds of Montana. 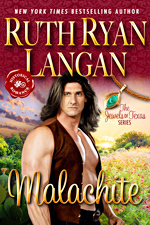 Malachite is as wild and untamed as the devil stallion he vows to vanquish. But even a man as strong as this Comanche warrior cannot conquer the way his blood rages for gentle widow Millie Potter. In her loving arms this lonely heart has found a home.